Over the last 100 years the Coca-Cola Company has served up some of Americaâ€™s most iconic advertisements. From the 1959 "Santaâ€™s Refreshing Surprise" to Norman Rockwellâ€™s 1935 "Out Fishinâ€™". . . to 1971â€™s "Iâ€™d Like To Buy The World A Coke" and "Drink Coca-Cola" from 1925, compete to own the best COCA-COLA ads of all time. 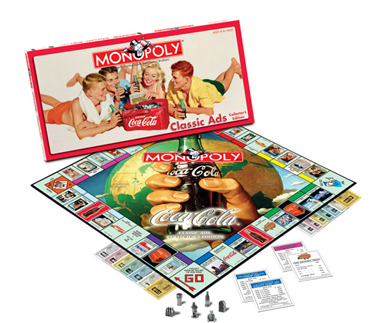 COCA-COLAÂ® and COKEÂ® brand board games are produced for The Coca-Cola Company, owner of the trademarks COCA-COLA, COKE and the Red Disc Icon by USAOPOLY, Inc., an authorized user. Â©2005 The Coca-Cola Company. All rights reserved. Used under license from The Coca-Cola Company.